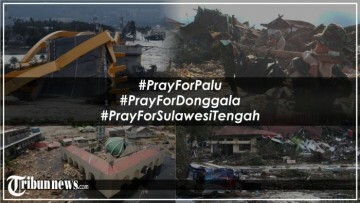 The earthquake-tsunami disaster that hit Palu and Donggala in Central Sulawesi became the grief of the Indonesian people. Not only thousands of victims were killed by the earthquake, residents in seven sub-districts in Sigi Regency are now isolated. Logistics supplies in the form of food and medicine were stopped because access to the location was cut off due to landslides. Even the condolences of grief continue to flow to Palu and Donggala. For those who survived the awesomeness of the earthquake and tsunami, last Friday, September 28, now witnesses how terrible it was when the waves were nearly 3 meters high hit Palu and its surroundings. Not only the sweeping waves of the sea, the earth stepped on it also shook violently. Soil moves and melts quickly. Before long, hundreds of homes were lost and drowned with mud. The impact of the tsunami Palu did not only make Indonesian citizens shock. Shock waves also spread throughout the world. "Earthquake And Tsunami Palu And Dongga,"